ଗୋଟେ ପିରାଲୀ ବ୍ରାହ୍ମଣ କଲିକତାର ପୈତୃକ ସମ୍ଭ୍ରାନ୍ତ ଶ୍ରେଣୀର ଲୋକ ଜେସର ସହର ସହ ସମ୍ପର୍କ, ସେ ଯେତେବେଳେ ୮ବର୍ଷ ବୟସର ହେଇଥିଲେ ସେତେବେଳେ ସେ ଲେଖା ଆରମ୍ଭ କରିଥିଲେ . ଷୋହଳ ବର୍ଷ ବୟସ ରେ, ସେ ଉନ୍ମୋଚନ କରିଥିଲେ [[Bhānusiṃha Ṭhākurer Paḍāvalī|ତାଙ୍କର ମୂଲ୍ୟବାନ କବିତା ]କୁ ,ତାକୁ ନିଜ ଛଦ୍ମନାମରେ ବାହାର କରିଥିଲେ Bhānusiṃha ("Sun Lion"), ଯାହା ଲାଇବ୍ରେରୀରେ ସର୍ବୋଚ୍ଚ କ୍ଷମତା ଗ୍ରହଣ କରିଥିବା ବହୁଦିନରୁ ହଜିଯାଇଥିବା। ଅନୁବାଦରେ ତାଙ୍କ କବିତା ଅଧ୍ୟତ୍ମିକ ଓ ସୁଲଳିତ ଥିଲା ,କିନ୍ତୁ ତାଙ୍କର ରୁଚିପୂର୍ଣ ଗଳ୍ପ ଓ ସୁମଧୁର କବିତା ବହୁତ ସମୟ ପର୍ଯ୍ୟନ୍ତ ବଙ୍ଗଳା ବାହାରେ ଜଣା ନ ଥିଲା।୧୮୭୭ ମସିହାରେ ସେ ନିଜେ ଛୋଟ ଗଳ୍ପ ଓ ନାଟକ ନିଜ ନାମରେ ପ୍ରକାଶନ କରି ଥିଲେ। ସେ ଜଣେ ମାନବବାଦୀ, ଭୌମିକତା, ଅନ୍ତରାଷ୍ଟ୍ରୀୟବେଦୀ ଥିଲେ।  ସେ ବ୍ରିଟିଶ ଶାସନର ନିନ୍ଦା ଓ ଭାରତର ସ୍ୱଧୀନ ପାଇଁ ଓକିଲାତି କରୁ ଥିଲେ। ବଙ୍ଗଳା ପୁନଃଜାଗରଣ ର ପ୍ରତିବାଦକ ରୂପରେ ,ସେ ଚିତ୍ର, ଚିତ୍ରାଙ୍କନ ,୧୦୦ ବହି, କିଛି ୨୦୦୦ ସଂଖ୍ୟକ କବିତା,ଇଚ୍ଛାପତ୍ର ସାମିଲ ଥିଲା,ତାଙ୍କଦ୍ୱାରା ସ୍ଥାପିତ ସ୍ଥାୟୀ ବିଶ୍ୱ ଭାରତୀୟ ବିଶ୍ୱବିଦ୍ୟାଳୟ। . At the Majlis in Tehran, 1932. Primitivism: a pastel-coloured rendition of a Malaganmask from northern New Ireland. 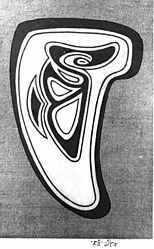 Tagore's Bengali-language initials are worked into this "Ro-Tho" wooden seal, stylistically similar to designs used in traditional Haida carvings. 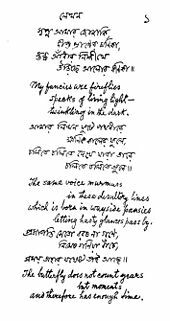 Tagore embellished his manuscripts with such art. 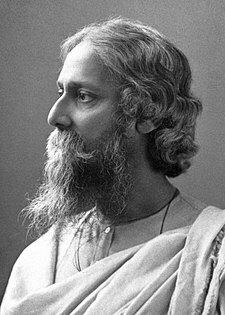 the pathos of the purabi raga reminded Tagore of the evening tears of a lonely widow, while kanara was the confused realization of a nocturnal wanderer who had lost his way. In bhupali he seemed to hear a voice in the wind saying 'stop and come hither'.Paraj conveyed to him the deep slumber that overtook one at night's end. 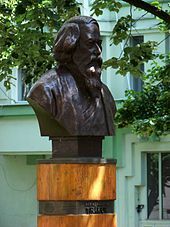 —Reba Som, Rabindranath Tagore: The Singer and His Song." "Tabu Mone Rekho", a song by Tagore, sung in his own voice. The song was written in 1887 CE (1294 Bengali year. Surrounded by several painters Rabindranath had always wanted to paint. Writing and music, playwriting and acting came to him naturally and almost without training, as it did to several others in his family, and in even greater measure. But painting eluded him. Yet he tried repeatedly to master the art and there are several references to this in his early letters and reminiscence. 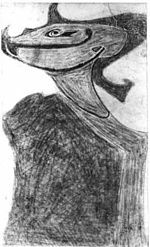 In 1900 for instance, when he was nearing forty and already a celebrated writer, he wrote to Jagadishchandra Bose, "You will be surprised to hear that I am sitting with a sketchbook drawing. Needless to say, the pictures are not intended for any salon in Paris, they cause me not the least suspicion that the national gallery of any country will suddenly decide to raise taxes to acquire them. But, just as a mother lavishes most affection on her ugliest son, so I feel secretly drawn to the very skill that comes to me least easily." He also realized that he was using the eraser more than the pencil, and dissatisfied with the results he finally withdrew, deciding it was not for him to become a painter. but the meaning is less intellectual, more emotional and simple. The deliverance sought and won by the dying child is the same deliverance which rose before his imagination, [...] when once in the early dawn he heard, amid the noise of a crowd returning from some festival, this line out of an old village song, "Ferryman, take me to the other shore of the river." It may come at any moment of life, though the child discovers it in death, for it always comes at the moment when the "I", seeking no longer for gains that cannot be "assimilated with its spirit", is able to say, "All my work is thine". Pôthe jodi pichhie poŗi kobhu. 'Ei bedona khôma kôro khôma kôro probhu. 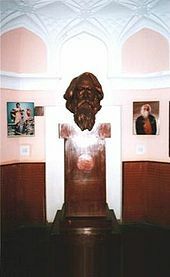 Tagore Room, Sardar Patel Memorial, Ahmedabad. —Amartya Sen, "Tagore and His India". 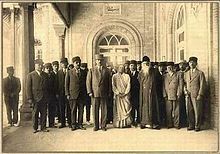 ↑ "Work of Rabindranath Tagore celebrated in London - BBC News". BBC News (in ଇଂରାଜୀ). Retrieved 15 July 2015. ↑ Habib, Haroon (17 May 2011). "Celebrating Rabindranath Tagore's legacy". The Hindu. ↑ Haque, Junaidul (7 May 2011). "Rabindranath: He belonged to the world". The Daily Star (Bangladesh). ↑ de Silva, K. M.; Wriggins, Howard (1988). J. R. Jayewardene of Sri Lanka: a Political Biography - Volume One: The First Fifty Years. University of Hawaii Press. p. 368. ISBN 0-8248-1183-6. 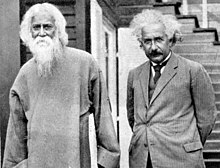 ↑ "Man of the series: Nobel laureate Tagore". The Times of India. Times News Network. 3 April 2011. 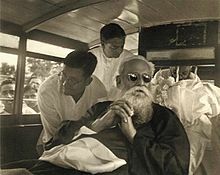 ↑ "How Tagore inspired Sri Lanka's national anthem". IBN Live. 8 May 2012. ↑ "Visva-Bharti-Facts and Figures at a Glance". ↑ ୨୩.୦ ୨୩.୧ ୨୩.୨ Ghosh 2011. ↑ ୨୪.୦ ୨୪.୧ Thompson 1926, p. 20. ↑ ୩୪.୦ ୩୪.୧ Tagore & Chakravarty 1961, p. 45. ↑ Scott 2009, p. 10. ↑ Som 2010, p. 38. ↑ "Tabu mone rekho" (in Bengali). tagoreweb.in. Retrieved 11 May 2012. 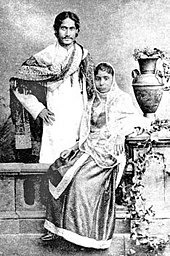 ↑ Tagore & Mukerjea 1914, p. 68. 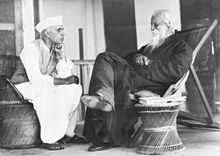 ↑ Tagore & Mukerjea 1914, pp. v–vi. ↑ Prasad & Sarkar 2008, p. 125. ↑ Tagore 1952, p. 5. ↑ Tagore, Alam & Chakravarty 2011, p. 323.